The George Harrison Estate is happy to announce their new label, HariSongs, created in partnership with Craft Recordings to release the Harrison family archive of Indian Classical and World music and George’s collaborations with the finest exponents of Indian Classical music. To celebrate this body of music, HariSongs launches today with two reissues in honour of Ravi Shankar and Ali Akbar Khan’s shared birthday month (b. 7th April, 1920 and 14th April, 1922, respectively). These titles — both recently out-of- print, and never before available via streaming platforms — are the acclaimed Ravi Shankar and Ali Akbar Khan In Concert 1972 and the last collaboration by George Harrison and Ravi Shankar, Chants of India. These digital-only reissues are now available for the first time via streaming outlets, as well as to download. In Concert 1972 was originally released via Apple Records in 1973, with a statement that read: “Within the small community of brilliantly gifted musicians there exists an even smaller world of Masters. Two of these masters recently joined together in concert …"
The album features two of Indian Classical music's greatest artists at the height of their powers, the sitar maestro Ravi Shankar and master of the sarod, Ali Akbar Khan. The album captures the live recordings from a performance that took place at New York City's Philharmonic Hall on October 8, 1972 and was edited and mixed by George Harrison with Zakir Hussain and Phil McDonald. Featuring tabla accompaniment by the great Alla Rakha, this mesmerising concert comprises three ragas played in the jugalbandi style (or a duet played by two solo musicians) and became a poignant tribute to the guru of both soloists (and the father of Ali Akbar), the great Allauddin Khan, who had died but a month previously. Audio for this reissue was sourced from the original master 1/4” analogue tapes which were digitized at FPSHOT (Friar Park Studio Henley-on- Thames) and remastered by Paul Hicks, Gavin Lurssen & Reuben Cohen at Lurssen Mastering (Hi-Res 96/24 and 192/24 audio also available). 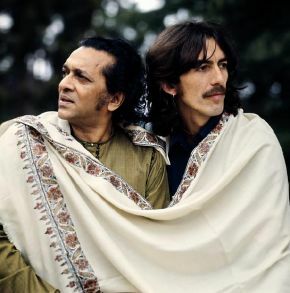 Chants of India by Ravi Shankar and produced by George Harrison was originally released in 1997 on Angel Records. Shankar and Ali Akbar Khan. was played first time in 1958/59 in a concert arranged by Rajeev Dave in Allahabad. All songs are traditional, arranged by Ravi Shankar, except where indicated.